This quaint and comfortable (2) bedroom, (2 ½) bath condo is located in the gated community of Geneva National on the Trevino course. Geneva National is just 5 minutes from downtown Lake Geneva. This condo features a fireplace; washer and dryer, central air, deck and attached (1) car garage. 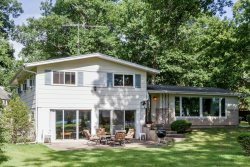 Enjoy the great proximity to the happenings of downtown Lake Geneva as well as the Geneva National amenities that include (3) outdoor swimming pools and tennis courts (the daily pool fee is $12 for adults and $8 for under 12 years old). You can also find a nature trail and playground equipment in the community. Geneva National Golf Club: Located just 4 miles west of Lake Geneva, Wisconsin, this 1600-acre community surrounds the 54 holes of Legendary Golf, and also offers tennis, swimming, water sports, and miles of scenic hiking trails and much more. Enjoy the fitness center, open daily from 6am to 8pm.